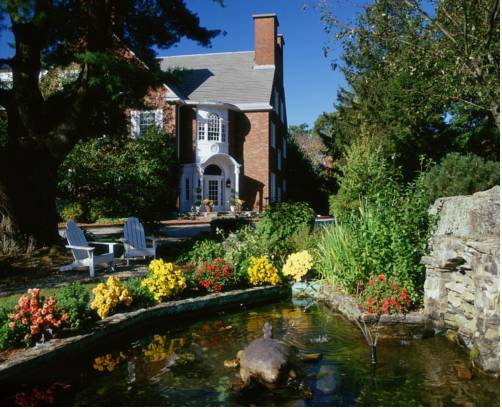 The Spa at Norwich Inn is located on an expansive forty two acre property in the woodlands of eastern Connecticut. Situated near the seventeenth tee of the Norwich Public Golf Course our grounds abound with perennial gardens shimmering ponds and inviting walkways. Oak trees a reflecting pool and an oversized deck compliment the atmosphere promoting the ultimate in relaxation. With one hundred guestrooms suites and villas The Spa at Norwich Inn is both ample and accommodating. The Spa prides itself on the personalized attention our guests deserve. Uniformed Valet attendants are available to park your car. Cheerful doormen greet you upon arrival. Our Bellmen will gladly deliver your luggage to your guestroom. Nightly turn down service includes refreshing your towels and leaving rich chocolates on your pillow. During your stay our Concierge Desk will be available to help with any special arrangements you may require. 24 hours advance notice. Exceptions may apply - please see rate rules. Room service is offered by Kensingtons and there is a separate room service menu which is a limited Kensingtons menu. The pioneering 19th century English nurse is always depicted in her nurse cap. In any other state, this minor artifact would be buried in the tourist attraction pile. Not in Rhode Island! This large, grimacing, half-human bee in a sailor's cap is ready to sting America's foes. Fiberglass Paul Bunyan Muffler Man statue holds a flag to comply with town signage laws.